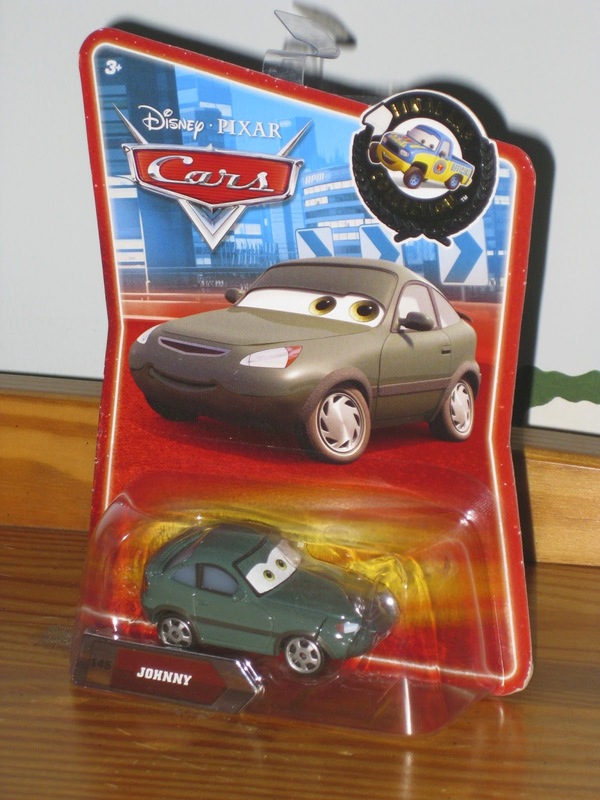 From the original Cars, here we have the Mattel 1:55 scale diecast of Johnny! This character has been released just once, in the "Final Lap" collection back in 2010. Johnny is one of those cars that if you blink, you'll miss his appearance in the film. Not only that, but you pretty much have to squint to see him. Talk about a minor character, ha! How did this one make it into a diecast? As seen above, Johnny can be seen on the stands at the big Los Angeles Speedway near the end of the film. If you look closely at the included screenshot, you can see him and his buddy Jamie (the blue car next to him of the same model) hanging over the railing waving. Jamie was also released as a diecast; you can read that post right HERE. A couple Christmases ago, my little brother in-law Johnny gave this to me as a gift since, well, they're both named Johnny! I thought it was fitting so that was my request from him. Anyway, I just wanted to give him a big thanks and shout out here on the blog.